Many college football experts and fans have been asking for years: What’s wrong with the Notre Dame football program? It may be a lack of continuity in head coaches or the inability to recruit the best high school players or the fact that the talent is now spread all over the country that has led to the downfall of Notre Dame. 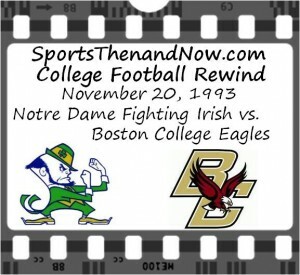 But for those who are superstitious or believe in luck, they will point to the Irish’s last-second loss to Boston College in the final game of the 1993 regular season that not only shattered the dreams of the Irish’ s chances of a national title that season, but has brought several years of mediocrity for the Irish. 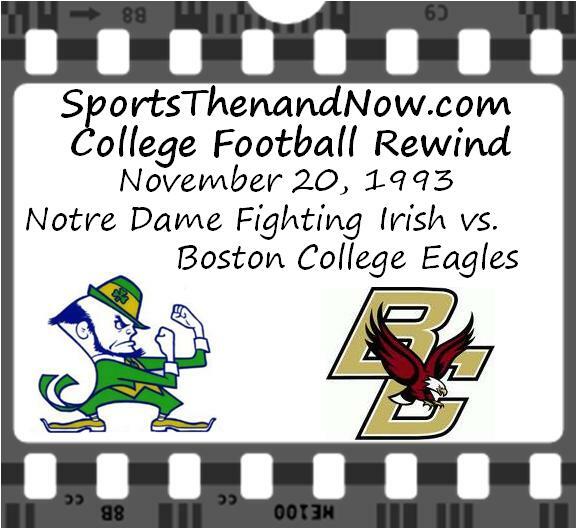 Notre Dame entered the game with Boston College as the #1 team in the country following their 31-24 victory over Florida State in a game billed as the “Game of the Century” and had won their previous 17 games. With one more victory, the Irish would finish the regular season with an 11-0 record and probably would go on to play in the Fiesta Bowl in a rematch against Florida State with a chance for a second national title under head coach Lou Holtz. The one remaining obstacle between the Irish and a trip to Tempe was the #17 ranked Boston College Eagles, who were coached by future head coach Tom Coughlin in his third season as the BC head coach. The Eagles had rebounded from a 0-2 start which included a 22-21 loss to lowly Northwestern when kicker David Gordon missed a potential game-winning 40-yard field goal with over a minute left, to win their next seven games, thanks to a high-powered offense led by quarterback Glenn Foley and running back Darnell Campbell, who was the nation’s leading scorer with 20 touchdowns.